Back to scheduled posting, I have another version of the Greek files. 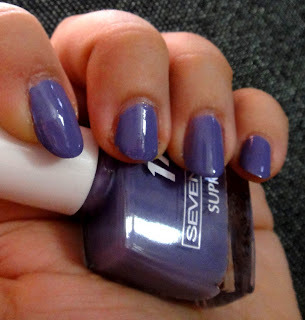 In 2011 Seventeen Cosmetics released a professional nail polish line called Supreme with some very pretty colours. Also following the crackle trend they have their own line called Shock. I wanted to try both these lines so I picked a colour from each. I chose Seventeen Supreme #19 a lovely purple and Seventeen Shock 1004 a metallic shade. First I applied two coats of #19 over basecoat. The colour is beautiful and the polish applies perfectly. One coat would have been enough but I applied a second one for extra shine. After it was dry I added a coat of Shock 1004. I really liked how this cracked, I think Seventeen did a great job with this line! As I found this a very interesting combination, I picked up an extra bottle of each colour to do a giveaway for my lovely readers. The giveaway is open internationally and will last until October 31. I will keep the rules super simple this time. All you have to do is be a public follower of my blog and leave a comment on this post saying you are in. To protect your privacy, please do not leave emails in the comments. I will announce the winner on my blog in early November and then the winner can email me with their details to claim the prize. If the winner does not contact me within 48 hours I will pick someone else. Simple as that. I´m follower and I really want to participate in your giveaway. Thanks!! I follow you as rock-or-not! GFC follower as Diana and I'm in. I'm a follower (Under this or Andrea Trenary I'm never quite sure how it shows up), awesome looking polishes, great giveaway! Hi! Those 2 look like great colors, so I would love to enter the giveaway! I'm already a follower, enter me please! Oh, they both look great, I'm in! i follow and please count me in! !i always use seventeen nail polishes but i dont have those colours! !wish i will win!! im already a blog follower :) enter me pls. i want to win. Omg, thank u so much for this post! I was wondering if the Seventeen crackle ones were any good! That metallic one looks gorgeous!!! And OFC I'm in!!! Lol!!! Ps: the skulls in your template are amazing! I'm in! :) I'm already following via GFC as Jasmine1485. Wow Seventeen came out with crackle nail polish?? Awesome!! hello! i love the purple color. enter me please! love this combination! I'm following you either as indyhaw or cindy-y, I'm not sure what shows up.. but I'm in! Hi! Please enter me! Thanks! Oh, I guess your time is different than where I am. It's still the 31st here. But if it doesn't count I understand! Sorry for the trouble!